West Central Support can provide your business with a customized broadband solution to meet your unique business need. Whether you simply need DSL speed internet access or something much faster, West Central Support can provide a data solution customized for your organization. 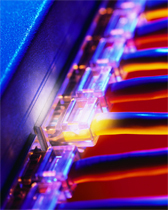 West Central Support can provide a data transport solution for your organization. If your business requires the sharing of information between multiple locations, a point to point solution may be what your business needs. Our staff of engineers can develop and quickly implement a customized transport solution for your organization. West Central Support's wireless professionals can provide cost effective wireless broadband data solutions to organizations with hard-line limitations. Our network of towers and our portfolio of wireless options and equipment enables us to reach areas that are well beyond the range of other data providers.